As the first step to sorting out some sort of coalition deal Fine Gael & Labour in a co-ordinated move last night announced that they had discovered the financial situation was worse than expected. This follows only days after the election and the subsequent vote by all but two of Labour's central council to enter into coalition talks with Fine Gael. Clearly the scene is being set for not only Labour but also Fine Gael to abandon the promises they were elected for, only days after the supposed exercise in 'democracy' of Election 2011 and before a government has even been formed. So much for Enda Kenny's proclamation of "a democratic revolution at the ballot box", instead it's the usual Dail as parliament is meant to work, free from the interference of the masses. Today, in an even more meaningless exercise then normal, a minority of the population of Ireland will choose between two almost identical options as to who will implement the ECB / IMF austerity plans for southern Ireland. Outside of this plan the wealthiest 1% will continue to set economic policy tomorrow as they did yesterday and have throughout the last decades. The electoral circus we are now going through provides the rest of us with the illusion of control even though deep down almost everyone acknowledges the ritual as having no real impact on what policies are actually implemented. 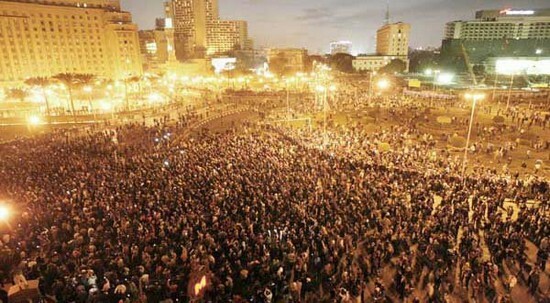 As protests continue in Egypt the people are becoming more organised and creating their own structures. After a few days of unsuccessfully trying to smash the movement for change through violent repression, the police were withdrawn from the streets and the army ordered in. The largely conscript army however was unwilling to use violence against the population, whom the majority of soldiers clearly sympathise with. Tens of thousands of Egyptians have taken to the streets to demand an end to the dicatorship of Hosni Mubarak. The protests echo the recent overthrow of the dictator in Tunisia. Today is a national holiday in Egypt to celebrate the police, a brutal force and a key component in keeping Mubarak in power. 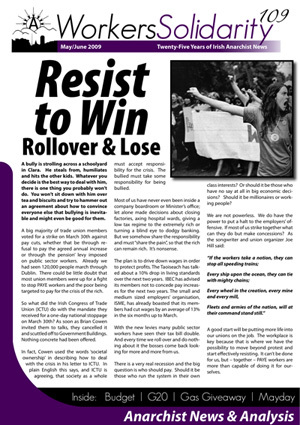 January - February 2011 Edition of the Workers Solidarity freesheet.